Lisa Deshaun Leslie (born July 7, 1972) is the Head Coach for Triplets in the BIG3 professional basketball league, as well as a studio analyst for Orlando Magic broadcasts on Fox Sports Florida. Leslie is a former American professional basketball player who played in the Women's National Basketball Association (WNBA). She is a three-time WNBA MVP and a four-time Olympic gold medal winner. The number-seven pick in the 1997 inaugural WNBA draft, she followed her career at the University of Southern California with eight WNBA All-Star selections and two WNBA championships over the course of eleven seasons with the Los Angeles Sparks, before retiring in 2009. Leslie was the first player to dunk in a WNBA game. In 2011, she was voted in by fans as one of the Top 15 players in WNBA history. In 2015, she was elected to the Naismith Memorial Basketball Hall of Fame. Leslie was named coach of Ice Cube's BIG3 expansion team Triplets on January 10, 2019. Leslie was born in Gardena, California, the daughter of Christine Lauren Leslie, who stood 6 feet 3 inches (1.91 m), and Walter Leslie, a semi-professional basketball player. Christine started her own truck driving business to support her three children. Walter left the family when her mother was four months pregnant with her. Leslie has two sisters: Dionne, who is five years older, and Tiffany, who is eight years younger. She also has a brother, Elgin. She played on an all-girls team with the record 33–1. During the first few weeks of middle school, a classmate begged Leslie to help out the basketball team. On her first day of basketball tryouts, team members were told to split into two groups for layup drills: lefties and righties. Leslie was the only lefty in the group, so from then on, she decided to become right-hand dominant so she would not have to stand in a line by herself. That decision worked to her advantage, as she became ambidextrous. Leslie was named to the USA Basketball Women's Junior National Team (now called the U19 team). She was 17 at the time, the youngest player on the USA team. The team participated in the second Junior World Championship, held in Bilbao, Spain in July 1989. The USA team lost their opening game to South Korea in overtime, then lost a two-point game to Australia. After winning their next game against Bulgaria, behind 22 points and nine rebounds from Leslie, the USA team again fell in a close game, losing by three points to Czechoslovakia. After beating Zaire in their next game, the USA team played Spain, and fell three points short. Leslie led the team in scoring, rebounds, and blocks, averaging 13.3 points and 7.0 rebounds per game and recording 21 blocks over the course of the event. The USA team finished in seventh place. Leslie has had a fierce rivalry with Lauren Jackson ever since the 2000 Olympics, when the Australian star ripped out Leslie's hair extensions during a game. On November 5, 2005, Leslie married Michael Lockwood, who played basketball for the Air Force Academy and is currently a pilot for UPS. In 2007, she took a year's leave from professional basketball for a pregnancy. Leslie and Lockwood have a daughter named Lauren Jolie Lockwood, who was born on June 15, 2007. After having the baby, Lisa got back in shape and returned to the WNBA for the 2008 season. Leslie had her second child, Michael Joseph Lockwood II, on April 6, 2010. Leslie is also a fashion model and an aspiring actress. She has been featured in Vogue and Newsweek, as well as many sports publications. She has been on ESPN numerous times and has been a guest star on several television shows such as Sister Sister, The Game, and One on One. She is a guest commentator for "Sports Zone" on KABC-TV/Los Angeles and wears the Circle 7 logo from the channel when on the show. She has also acted in a variety of commercials. Early in her career she signed a modeling contract with the Wilhelmina modeling agency. Lisa also was on the show, Superstars, and she and her partner, David Charvet, took 3rd place after David injured his wrist. Leslie also played herself in an episode of the TV-show The Jersey called "Nick's a Chick", where she switched bodies with a boy named Nick Lighter (played by Michael Galeota). In addition, she played herself in one episode of The Simpsons. She also appeared in the movie Think Like A Man, and played as herself. Leslie is also a playable character in the original Backyard Basketball, alongside Kevin Garnett. She was only the fourth female professional athlete in the Backyard Sports series, after Brianna Scurry, Brandi Chastain, and Tiffeny Milbrett. She also appeared in the 2nd episode of "All in with Cam" with host, Cam Newton. In 2013, Lisa switched places with Downtown Julie Brown on the show Celebrity Wife Swap. On January 28, 2016, it was announced that she would be a contestant in The New Celebrity Apprentice (also known as Celebrity Apprentice 8). Recently, she played septuagenarian Betty Lou in Uncle Drew which hit the theaters in June 2018. In 2009, Leslie earned a Masters of Business Administration (MBA) degree from the University of Phoenix. Since her retirement from professional basketball, Leslie has worked as a sports commentator and analyst for several sports networks, such as NBC, ABC and Fox Sports Net. She had also released an autobiography called Don't Let the Lipstick Fool You. In 2011, she had become a co-owner of the Los Angeles Sparks. In 2018, Leslie joined Fox Sports Florida as a studio analyst on Orlando Magic broadcasts. Leslie is also a Christian. In a most recent interview, she spoke out about her faith by saying: "As a prayerful kid, I was always putting my faith and goals in the Lord’s name. That was always one of the things that helped me the most. I always wanted to fulfill His purpose. I think that’s really been the saving grace for me. When you have faith, you have to step out on it [and trust God]." ^ a b "Lisa Leslie Bio". NBC Universal. Archived from the original on September 17, 2016. Retrieved December 21, 2008. ^ a b c "Lisa Leslie Biography". Black Book Partners. 2008. Retrieved December 21, 2008. ^ a b c Meyer, Jan (1997). "Women in Sports". Retrieved December 21, 2008. ^ Peter, Josh (July 21, 2008). "Day in the life of Lisa Leslie". Yahoo. Retrieved December 21, 2008. ^ "USC Media Guide" (PDF). Retrieved September 12, 2017. ^ a b c Gretchen (March 22, 2006). "Girls Can't What". Archived from the original on October 20, 2007. Retrieved December 21, 2008. ^ "Sportswoman of the Year Award". Women's Sports Foundation. Archived from the original on July 22, 2009. Retrieved August 3, 2009. ^ "WNBA's History". Archived from the original on August 21, 2011. Retrieved July 15, 2014. ^ "Triple-Doubles, Dunks and 20–20 Games – WNBA.com – Official Site of the WNBA". ^ "SW Day 25: Leslie first to dunk in a WNBA game". ^ "Sparks' Leslie becomes 1st player to 6,000 points". AP. Retrieved August 12, 2009. ^ "WNBA.com: AllStar 2011". www.wnba.com. ^ "Second FIBA Women's U19/Junior World Championship – 1989". USA Basketball. June 10, 2010. Archived from the original on September 7, 2015. Retrieved October 20, 2015. ^ "FIFTEENTH WORLD UNIVERSITY GAMES – 1991". USA Basketball. Archived from the original on January 11, 2013. Retrieved June 12, 2010. ^ "1992 WOMEN'S R. WILLIAM JONES CUP". Archived from the original on August 8, 2014. Retrieved August 3, 2014. ^ "Dan Carter signs four-deal to stay in NZ". Archived from the original on September 18, 2008. Retrieved February 6, 2009. ^ "Video". CNN. August 30, 2004. Archived from the original on April 9, 2009. Retrieved May 7, 2010. ^ "Australian basketball star Lauren Jackson dreams of gold". July 20, 2008. Archived from the original on April 9, 2009. ^ "Lisa Leslie: 'My Husband Taught Me the Difference Between a Man and a Boy'". Essence.com. December 16, 2009. ^ "Michael Lockwood WNBA Lisa Leslie's husband". February 25, 2016. ^ "Michael J. Lockwood – Penguin Random House Canada". Penguin Random House Canada. ^ "SPARKS: Sparks Star Lisa Leslie has Baby Girl". www.wnba.com. ^ "Lisa Leslie Welcomes Son Michael Joseph II". ^ McMullen, Laura (March 2, 2012). "Lisa Leslie: From WNBA to M.B.A." U.S. News & World Report. Retrieved October 16, 2015. ^ "Leslie joins up with Sparks' ownership group". ^ Robbins, Josh. "Lisa Leslie joins Fox Sports Florida's Magic telecast crew". OrlandoSentinel.com. Retrieved February 10, 2019. ^ "Lisa Leslie balances family, fame". brnow. Retrieved September 12, 2017. 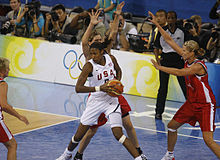 Wikimedia Commons has media related to Lisa Leslie.